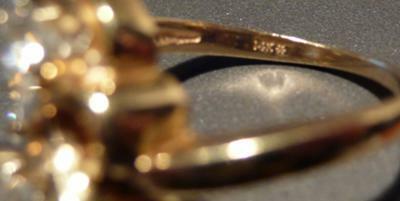 Free form Gold & Diamond Ring with asterisk marking...what does it mean? I have a free form gold ring that I'm told my grandmother worked with a designer to make at some point in the 1990s. It has 3 large diamonds of mediocre quality, but it is a substantial ring. The marking says 14K with an asterisk next to it. See image for detail. I have other images if needed. The only brand that I could come up with that uses an asterisk is Stuller. Is this right?